This elegant four bedroom chalet is fantastically positioned directly on the ski slopes of Reiteralm. The chic yet cosy apartment is ideally equipped for a holiday in the Styrian mountains, with a whirlpool bath and a sauna. You will also benefit from four bedrooms, two bathrooms and an open-plan kitchen and living area. 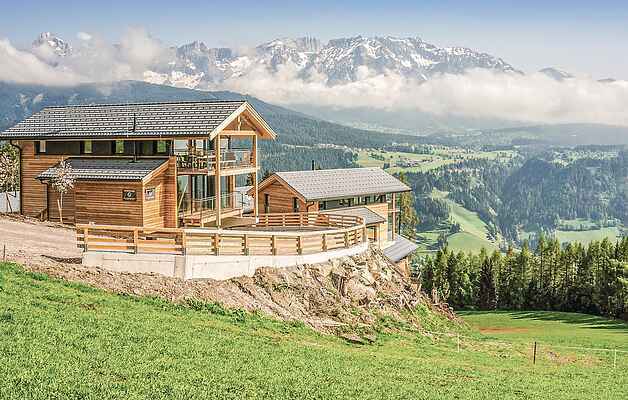 The chalet is a wonderful choice whatever time of year; during winter the ski area of Ski Amadé is home to 240 groomed slopes, which makes it one of the largest ski areas in Austria. During the summer months you will be spoilt for choice with over 1,000km of marked hiking trails and 930km of bike and mountain bike tracks. As a guest you will benefit from free admission to over 100 of the area's top leisure attractions, as well as numerous local discounts with the complimentary Sommercard. Alternatively, this beautiful apartment is a wonderful spot to simply kick back, relax and enjoy the stunning views of the surrounding mountains. Please note, it is mandatory to order bed linen and towels (payable locally).